The founder and chairman of children's orchestra charity Sistema Scotland has announced he will stand down in December. 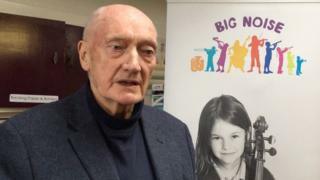 Richard Holloway, who is 85 in November, said watching the charity's achievements had been "the greatest privilege" of his life. Sistema Scotland's Big Noise projects run in Stirling, Glasgow, Aberdeen and Dundee. The first Big Noise project started in Raploch, Stirling in 2008. The project helps children by using music and the experience of being part of an orchestra. Sistema Scotland now works with about 2,500 children and young people every week across Scotland. Mr Holloway said: "The Big Noise adventure began for me 10 years ago in my youthful seventies. "Watching Sistema Scotland's glorious achievements over the last 10 years has been the greatest privilege of my life. "I am extremely sad to be standing down as chairman. "I'll be 85 in November and time is catching up with me, so I think I should now pass the baton onto someone who can run with it for the next 10 years and beyond." Big Noise performed with Nicola Benedetti at the Glasgow Commonwealth Games opening ceremony in 2014 and launched the London 2012 Festival for the Olympic Games. Big Noise will perform at the Glasgow Festival 2018 and BBC Proms in the Park later this year.